Freshman midfielder Marisa Viggiano takes on a defender. Viggiano, one of three freshman starters for Northwestern, will be counted on to play a key role as the Wildcats look to upset No. 4 West Virginia in the NCAA Tournament. In college sports, the biggest moments are supposed to belong to the most experienced players. And yet, when Northwestern (14-5-2, 7-3-1 Big Ten) squares off against No. 4 West Virginia (17-2-1, 6-0-1 Big 12) Friday at 5 p.m. in the second round of the NCAA Tournament, it will know that its trio of freshmen starters have proven ready for the pressure of the postseason. The Wildcats’ 1-0 first round victory over Washington State was a showcase game for NU’s youngest players. Freshman midfielder Marisa Viggiano was a driving force behind the Cats’ winning goal, picking out the run of sophomore forward Michelle Manning with a picture-perfect ball that led to the double-overtime winner. 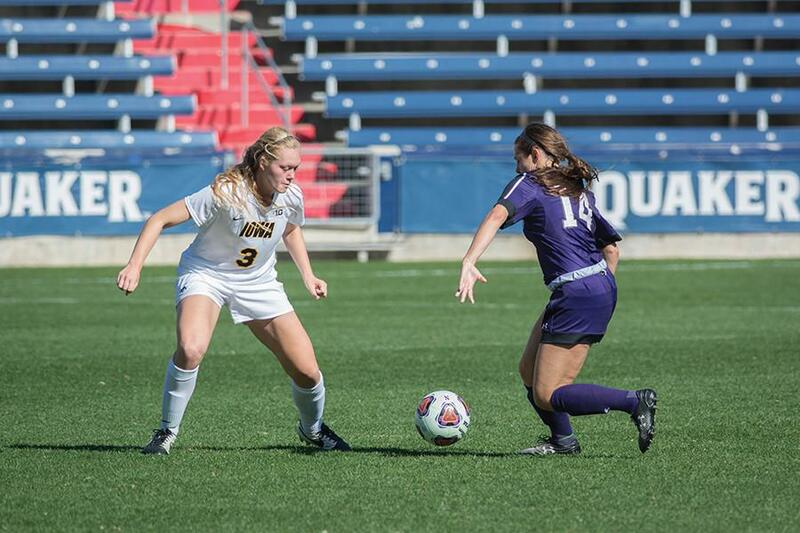 That NU even got to that point was a testament to the work of freshmen center backs Kayla Sharples and Hannah Davison in keeping the Cougars off the board. Sharples was seemingly everywhere, intercepting passes and making key tackles all over the pitch, while Davison made several critical plays of her own to prevent Washington State chances. Ordinary freshmen making their first postseason starts generally don’t land key victories, but coach Michael Moynihan said his freshmen aren’t as inexperienced as they might seem. And given their level of play all season, the performance of the Cats’ freshmen in their first NCAA Tournament game is no surprise. Sharples and Davison have anchored this year’s stout NU defense, while Viggiano’s work rate in the midfield has helped fill gaps on both ends of the field. All three have played key roles in what has been a tremendous defensive effort all season, with the Cats surrendering just .503 goals per game, the eighth-best mark in the country. Observers around the conference thought highly of NU’s freshmen as well, with both Viggiano and Sharples representing the Cats on the All-Big Ten freshman team. The play of NU’s freshmen has helped set lofty expectations for the team this season, and Davison said she’s really enjoyed the experience of playing at such a high level so early in her career. It will take great play from the freshmen, plus a host of other great performances, for the Cats to knock off title contender West Virginia in Mountaineers territory. West Virginia is the only team in the nation to rank in both the top five in goals scored and allowed per game. After contributing to the deciding goal of NU’s first-round victory, Viggiano knows the Cats will need to be decisive in the final third to stand a chance. Moynihan said his team will need to maintain some possession and string passes together when it sees the ball. If it can’t, an athletic Mountaineers attack will put NU’s defense under heavy pressure all game. That would thrust the Cats’ freshmen back into the spotlight, but Davison said she’s confident they’ll be up for the challenge like they have been all season.